These photos show the scene of a bus crash in Washington state on Nov. 22, 2018. A charter bus carrying dozens of members of the University of Washington marching band to a game at rival Washington State University rolled onto its side Thursday on an icy interstate, officials said. As NBC News reported, over 40 students and staffers on the bus were taken for treatment at local hospitals, but there were no reports of serious injuries, Washington State Patrol Trooper John Bryant tweeted after the Thanksgiving accident. The bus was one of six en route to Friday's Apple Cup showdown in Pullman when it flipped over at 5:26 p.m. PT, Bryant said. There were 56 people on board, mostly members of the University of Washington Husky Marching Band and spirit squads, according to the school. Many of those injured were treated and released. 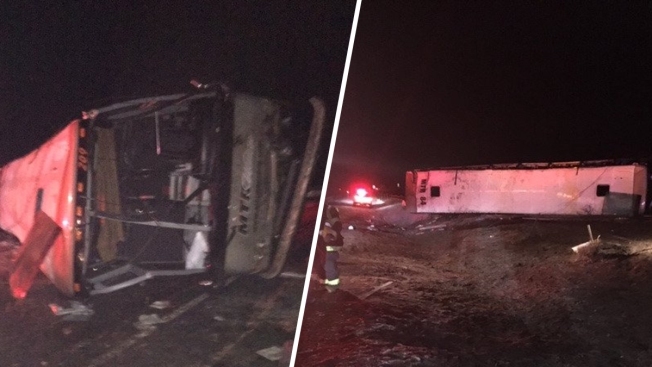 A band member who took a photo of the crash said the bus had spun out of control before it flipped into a ditch near the town of George, NBC affiliate K5News reported. The road was extremely icy at the time, officials said.